Riki Nakano-Domen journeyed to the Kapoho Lighthouse area on the Big Island with his family and friends for an overnight fishing trip. The water was choppy but the group caught enough bait to set up their ulua poles. Just before dawn, Riki hooked up a monster ulua that gave him an epic battle before coming to gaff. 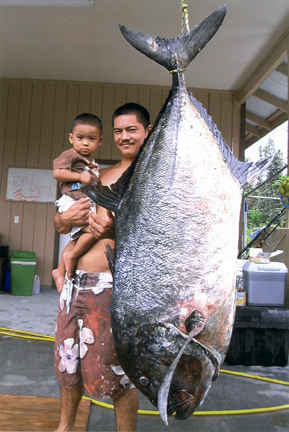 The ulua weighed 129.5 lbs at J. Hara Store.